Cover of the same-named track by Corey Hart. My Matrix no is ROCKERS 15 CD 01, not ROCKERS 05 CD 01. Maybe "05" is a typo that should be corrected? I can see why this single was only a limited edition, both remixes use samples from other tracks, with no credit anywhere on the record, almost a bootleg single. The Medicine 8 remix is IMHO the better of the two, a more club-orientated re-edit with Felix Da Housecat's vocals from Silver Screen Shower Scene layered over the intro. They fit okay at first, but the beatmapping seems to slip a bit further in. The recomposition is quite well done, the edited bassline makes quite a difference to the track. The overall end product is the original track beefed up for dancefloor use, with not so much of a melancholy feel. I must disagree with the above comments on the Cosmos remix, it's incredibly poor for such a generally good artist. The first four minutes are simply the original Sunglasses At Night, then all of a sudden Blue Monday by New Order starts. At first it fits nicely, then the tunes start to conflict and it all goes downhill. By the time the BM beat starts, I've generally taken the vinyl off the platter and put it back in its sleeve. Tiga's vocals don't fit the BM tune at all either, which sort of defeats the whole point of the mix. Blue Monday is admittedly quite well remixed in the usual Cosmos style, but it still doesn't fit with SAN. The whole feeling is that Middleton couldn't get permission to remix Blue Monday, so he slapped the start and end of Sunglasses At Night onto it and gave it to City Rockers to release, that's how little is done to the SAN portion of the mix. I expected more from such a revered remixer than a rather shoddy bootleg mix. Sounds a lot like the tune they sampled from, but it's still nice. The remix is just the same track with beats, not very original. It really is quite special. Blue Monday meets Sunglasses At Night? What were you thinking Middleton? A bloody great idea, but bloody hard to pull off. But the Jedi geezer does pull it off, and it goes right off. The Force is obviously strong in him (sorry, couldn't resist). Brilliant! Even if the electro scene is doomed to die out, at least some good records came out of it. The Tom Middleton rehash might be the best remix i've ever heard. 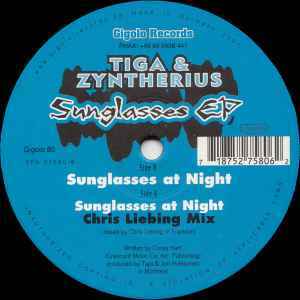 Tiga and Zyntherius (F-Comm's Jori Hulkkonen) come up trumps on Gigolo with an gloriously addictive electro version of Corey Hart's eighties hit 'Sunglasses At Night'. Chris Liebing adds a harder techno version on the flip. Not to mention the vocals and singing... Bravo!